Home/ Building Technology Guide / How to Calculate Steel Quantity for Slab, Footing and Column? Estimation of steel reinforcement quantity for concrete slab, footing and column, beams etc. is crucial for the cost evaluation for the construction. Design drawings are used as a base for computing rebar quantity in different structural elements. This article presents steel quantity computation process for slabs, columns, and footings. Obtain slab dimension and reinforcement details from design drawings as shown in Fig.1. Compute number of steel bars. 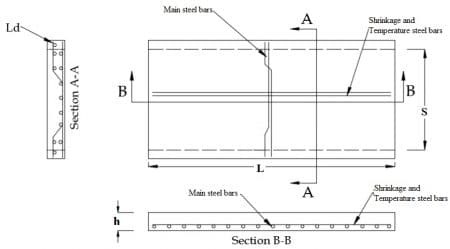 In equation 1, center to center spacing of main reinforcement steel bars are used and shrinkage and temperature bar spacing is used in equation 2. Ld: development length which illustrated in Fig. 2. 3. Convert that length into kilograms or tons because steel bars are ordered by weight. The same equation used for both main and shrinkage and temperature reinforcement, but corresponding cutting length, number of bars, and bar diameter is used. /162) is the weight of a steel which is derived from steel volume times its density which is 7850 kg/m3. Size of footing and its reinforcement details (bar size and spacing) shall be known. This can be achieved from design drawings. After that, the following steps will be taken to compute steel quantity. calculate the required number of bars for both directions. The above calculation procedure is for single reinforcing net. Therefore, for footings with the double reinforcing net, the same procedure need to be used again to compute steel quantity for another reinforcing net. Compute total length of longitudinal bars which equal to the column height plus laps for footing multiply number of longitudinal bars. 2. Calculate number of stirrup by dividing column height over stirrup spacing plus one. 3. Estimate total length of stirrup which is equal to stirrup cutting length times number of stirrups. 4. Convert that length into kilograms or Tons. This can be done by multiplying cross section area of steel by its total length by density of steel which 7850 kg/m3. Total steel quantity of column equal to the sum of both main and stirrup steels.